Vegan Cauliflower Nachos with Walnut Taco "Meat"
A healthy nacho recipe with dairy-free cheese sauce and walnut taco "meat." It's easy and delicious! Preheat your oven to 400ºF and chop the cauliflower into small florets. (I like to make sure the stems are at least cut in half for more-even baking, as they tend to take the longest to get tender.) 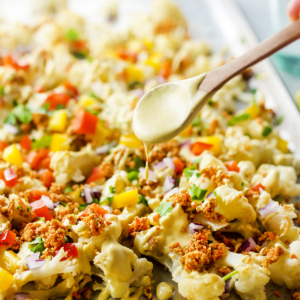 In a large rimmed baking sheet, drizzle a little bit of olive oil over the top of the cauliflower and toss directly in the pan to coat evenly. Arrange the cauliflower florets into a single layer on the baking sheet and sprinkle generously with salt. Roast until tender, about 25 minutes at 400ºF. The smaller you cut the florets, the faster they will cook, so you might want to keep an eye on them at the 20-minute mark if you cut them into bite-sized pieces. While the cauliflower is in the oven, prepare the Walnut Taco "Meat." Place the walnuts, or pecans if you prefer, in a small food processor and briefly pulse to break down the nuts into fine meal. Add in the diced carrots, salt, cumin, chili powder, and lemon juice and process again until a crumbly mixture is formed, somewhat resembling ground taco meat. Adjust any seasoning to taste and set aside. Next, make the "cheese" sauce. Drain and rinse the cashews well, then combine all of the ingredients in a high-speed blender until smooth and creamy. If the sauce is too thick, add one or two tablespoons of extra water to thin. Set the sauce aside. Once the cauliflower is tender, remove it from the oven and immediately add you toppings. Drizzle the cheese sauce over the top, sprinkle on the taco "meat," and add any other nacho toppings you like. You can return the pan to the oven to heat everything through for a few minutes more, but I prefer to serve it immediately and enjoy the contrast of hot and cold, and tender and crunchy vegetables. Leftovers can be stored in the fridge in an airtight container for up to one week.